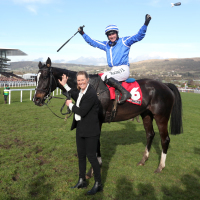 There is not much Willie Mullins has not done at the Cheltenham Festival but bringing a horse back to win a championship race on his first run of the season like Penhill did in the Sun Bets Stayers' Hurdle surely ranks highly among his achievements. Winner of the Albert Bartlett Novices' Hurdle at the meeting 12 months ago, Mullins had planned a global Flat campaign for the ex-Luca Cumani inmate. However, a series of setbacks put paid to that and Mullins was unable to get a run over hurdles into him. Strong late support for Sam Spinner meant he was sent off the 9-4 favourite, leaving Penhill a largely unconsidered 12-1 chance, but the market leader set only a steady pace and at the second-last, most of the runners still had some sort of a chance. Supasundae hit the front but Paul Townend looked confident and booted Penhill clear up the run-in in the colours of Brighton & Hove Albion chairman Tony Bloom. "Paul said to me he got to the front way too soon," said Mullins. "I have to give a lot of credit to his lass, Holly Conte, who rides him every day and treats him like a child every night. She really looks after him. "He has little niggles that need tending and that is why he missed the whole of the Flat season. When I told her (Conte) at the start I wanted this fellow for Cheltenham, she's got him here. "I was hoping to get a run into him. It's hard enough coming here for a two-mile race without one, never mind three (miles) in a championship race on this ground. It's a huge achievement on the horse's part. "I was quite surprised how little he was blowing. He was way fitter than I thought he was. "It just shows the ability he has, but I'll try not to go on the Flat as that was when his problems flared up. "We'll maybe go to Punchestown and have a proper jumps campaign next year." Townend said: "He's got a massive engine. "He jumped rusty enough early on but when I needed him at the last he produced." Jessica Harrington, trainer of runner-up Supasundae, said: "I'm delighted. At least he has come back and shown he is a proper Grade One horse (over three miles). It was a fantastic run and I know he will be better on better ground. He jumped brilliantly. He is a lot better horse this year than he was last year. "He was maybe just a bit outstayed on that ground, but it was a very brave run. He could go to Aintree, but we will see as we've got Punchestown as well. "He had a hard race there and I just might keep him for Punchestown." Jedd O'Keeffe said of the fifth-placed Sam Spinner: "I think it has come a year too soon for him and Joe (Colliver, jockey) just felt he was looking around at everything. "We've had to come, having won a Grade One at Ascot, but I think probably his lack of experience just told a little bit. "I'm not feeling nearly as disappointed as I thought I might. He is a very good horse still and we've got plenty of time on our hands to try to win something like this again. "I think it has been great, all the media attention, and one or two people might know who I am now. We will definitely look at Aintree, but we will see how he comes out of this first and see what the ground will be like. "If he is OK we will probably try him once more this year."